I’m always a little hesitant to use trendy healthy ingredients, but if they serve a use and taste good and aren’t too expensive then I’m happy to give them a go. Such is the case with wheatberries – (or ‘wheat grains’ as the health food shop packet sternly calls them), which are actually nice in a way that quinoa and equivalents will never be – they add texture and substance to salads and taste nutty and savoury. In short, they have character and seem vibrant rather than worthy. I encountered something similar called ‘Ebly’ when I was in Switzerland. It was so nice as a warm side dish – filling, satisfying, a great vehicle for butter – that we brought several boxes home. This same Ebly was offered as a salad on a $12 upscale burger menu in Swiss McDonald’s stores earlier this year, and there are lots of uses for wheatberries around other parts of Europe such as Cuccìa, a sweet Sicilian speciality which is traditionally eaten on December 13 to celebrate the unexpected arrival of a cargo of wheat during a food shortage. Wheatberries are perfect as the base of vegetable-heavy, herb-filled salads like this one, and they’re as tasty fridge-cold as they are served warm or at room temperature. They’re are also good for you – they probably are a lot easier to tolerate than orzo and cous cous, if that’s an issue, and because they contain both the bran and germ of the grain (label that diagram, Home Ec people) they also have lots of fibre and vitamins. Here I’ve served them in a salad with garlicky, harissa-spiked prawns, pomegranate seeds, flat leaf parsley and some beautiful, shockingly purple radishes from M&S. This prawn salad would be great as a starter or side in a Middle Eastern feast, or it would make a perfect ‘girl-food’ lunch if you’re having friends over. Start with the wheatberries. Although they’re easy to cook and don’t require soaking, they do take a bit of an age to cook. Simmer them with about 5 cups of water and a little salt over a medium heat stirring occasionally for about 50 minutes, or until they’re chewy but not tough. Drain, but leave about a 1/5th of the water still in the pan to keep them from drying out while they cool down. Meanwhile leave your frozen or raw prawns to macerate near the heat of the stove in a mixture of the harissa, olive oil and diced garlic. When they have thawed (if you’re using frozen) or turned a nice red colour, fry them in sunflower oil, adding a bit more harissa. If you have used frozen cooked prawns you can spoon a little of their tasty, garlicky liquor into the cooked and cooling wheatberries; if not just add a little olive oil to the grains. 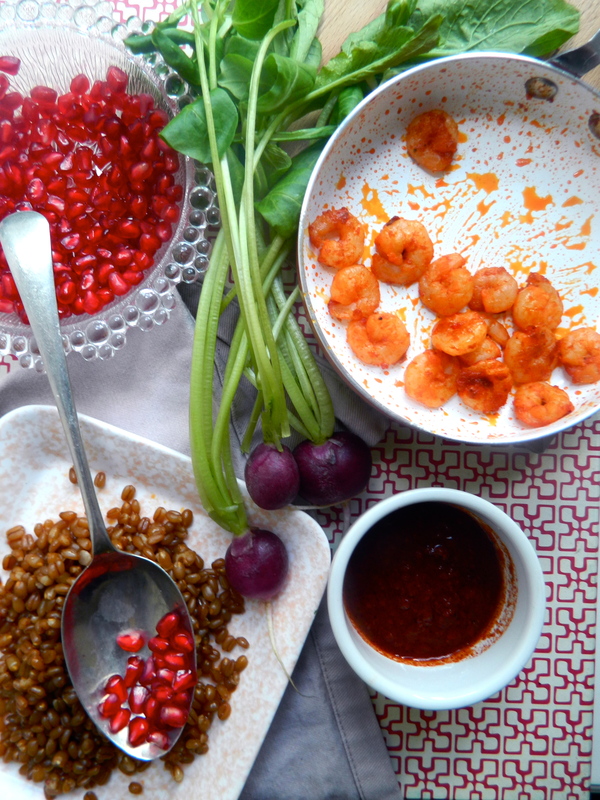 Knock the seeds out of the pomegranate, dice your parsley and rinse the leaves. Then toss it all together, drizzling a little olive oil over the top, along with a little lemon juice, some salt and perhaps a pinch of sumac. Garnish with some parsley, a few pomegranate seeds and maybe a few pink rose petals if you’re feeling flash. Try this salad also with avocado, feta and fried chorizo cubes.